The Vietnamese are not allowed to own land in Cambodia, so Vietnamese usually live on boats in floating villages. 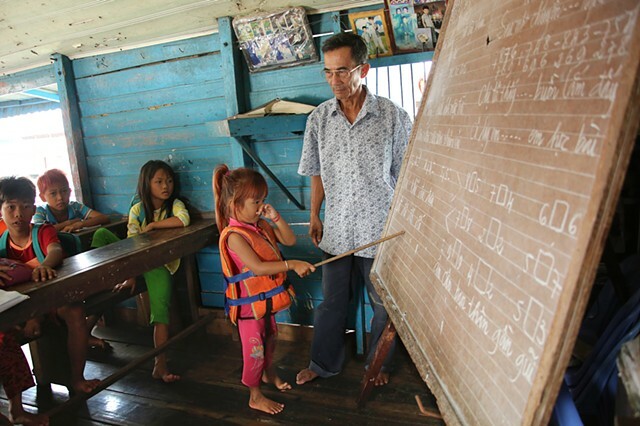 They are not allowed access to schools, thus this pastor/teacher and his wife set up a floating school in their own houseboat where Vietnamese children are taught to read and write in both Vietnamese and Khmer (the Cambodian language). Children travel to school in boats, and it's not uncommon to see the younger children in their life jackets all day long.